Liberté-Anne Lymberiou is from Montreal, QC but moved to New York City to explore jazz music. She is the founder, composer and producer of the Liberté Big Band, a 17 piece jazz band, in NYC. After unexpected Visa issues, Liberté-Anne has had to move back to Montreal, where she has formed a second big band under the same name, with artists from that Canadian city. We connected with Liberté-Anne to learn about her journey and the future of her bands in both cities. Read her story now, which highlights how this young woman is changing the traditional jazz scene at home and across the border. You are 25-years-old and the bandleader of Liberté Big Band. What lead you to find a career in jazz? For jazz, broadly, well, I had been playing music since childhood, and realized at 15 that I had to pursue music professionally, even though I wasn’t quite sure in what respect yet (well, I thought I would teach actually). I went to college to study voice (singing) and chose the jazz program because neither pop nor classical were appealing to me, and well, I had heard of Billie Holiday and Frank Sinatra and I liked ‘em. I was reading Paulo Coelho’s The Alchemist at the time, which really inspired me to listen to my instincts and follow my dreams. I also disliked every other subject at school so it didn’t leave me with much! I spent three years in college in Montreal (CÉGÈP Vanier), and by the second year I was fully into learning and being in this music. It touched me deeply, and so I decide to devote myself to learning the craft and move to NYC to learn it in its more authentic setting. However, at that time I still had it in my mind that I was pursuing music education. Not any more! What kind of music do you listen to, when you’re not working on Liberté Big Band? I recently went to Cuba and heard a lot of batà music, which is a type of religious music that also has a non-religious expression called Abelikula. So I’m listening a lot to the Abbilona group. I spent a lot of time with a portion of the band while I was in Cuba, learning from them and hanging out. It was an incredible experience. How did your band come together? Where are you all from? I formed the band in 2013, partly with musicians I knew personally and others I got referrals for and proceeded to cold-call to ask them to participate to our first rehearsals. There are about five original members remaining. Since last year the group as a whole has been pretty steady. Most of the musicians are American from different places, but all living in NYC. We’ve got some native New Yorkers from Brooklyn and Staten Island, then there’s Ohio, California, a lot of Seattle-Washington area, Pennsylvania, Minnesota, Florida, Baltimore, New Hampshire, all over really. One of our saxophonists is Brazilian – he’s the only immigrant aside from me! And sometimes I get my homegirl from Montreal to sub in the trumpet section, Rachel Therrien. She’s a great musician with four albums under her belt already. For my Canadian band (Liberté Big Band: Montreal Formation), all the musicians are residents of Montreal, and for the most part are from different parts of Quebec. I recently formed this band in April 2017. Photo by: Alex Joseph, http://photographyalex.com. You compose all the music yourself. What is the best part of this role? Having total artistic control and freedom. What would you say is the hardest part about being a bandleader, composer and brand-owner all on your own? Probably not falling into doubt and keeping a steady stream of energy and discipline. You also feel really lonely a lot of the time, cause it’s all on you and you do everything yourself. I take a lot of responsibility for everything, from quality of performance, to concert attendance, to group morale. Recently, I had an epiphany that I’m actually not alone (physically and spiritually), and since then, I feel like a weight has been lifted off my back. How much time do you spend working on Liberté Big Band? What limitations are there when you’re the front-runner and the organizer? I couldn’t tell you in hours but, I would say that in most everything I do, I consider it having to do with the band. If I’m not working specifically on say composition or promoting a show or running a rehearsal, I’m honing my skills as a pianist and conductor, I’m learning the history by listening, reading, researching, and I’m thinking about the band, thinking about my bandmates (whom I can’t be with at the moment), so I call them, see how they’re doing. I keep the band – the band members – in my mind a lot. I’m networking, I’m keeping myself open to opportunities, and that’s a full-time mindset. Every moment is an opportunity, and I put all opportunities into my band to make it grow. You’ve written that it’s not easy as a young woman to create in a space dominated by men in a genre that most people may not listen to today. 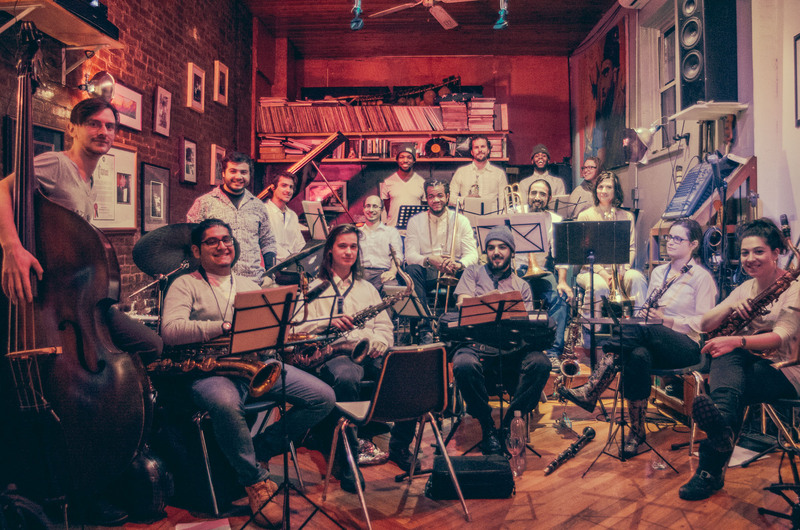 What is Liberté Big Band/what are you doing to challenge the jazz industry? I like to get musicians to focus on their business skills, as I am working on mine. I don’t claim to have accomplished anything in that realm yet. I haven’t even released an album! But I see how down musicians tend to get about the “music business” and they don’t see the amazing opportunities we have as far as connecting deeply to our audiences now that we have social media, for instance. Far too many in this community disregard it, don’t understand it, and what I think they’re forgetting is that finally we can reach our fans ourselves! We don’t need anyone above us dictating how our music gets distributed and to whom. The only ones who decide are the consumers themselves. It takes years to develop a true following but once that bond is established, I think it’s close to unbreakable. So that’s what I’m working on right now: Getting on my Instagram game hard and trying to be more strategic on Facebook. Learning Snapchat and musical.ly, while honing the good old email marketing skills and sales skills, which I don’t have at the moment! Help! I also have a project of creating really dope seond tier content on Youtube soon. It’s a speed and output game. Really that’s all it is. You have to hit it hard all the time. You have to be prolific. No easy task, but, hey, we are artists and we want to get paid for it. So that’s what we have to do. Just get it done and be patient. Artistically, I challenge the jazz scene I by not being “perfect.” That is, I leave space and I encourage imperfection (and therefore true spontenaity), which isn’t so common these days. I’m from the Mingus tradition (self-proclaimed, though I think it’s warrented): I like things bold and loud and tragic and weird, but thought out and purposeful. The trend in jazz these days is a really tight band, clear, clean sounds, smooth. I’m more loose, I just like that better. How do you deal with the pressures of being a woman, creating in a space dominated by men? I sort of instinctively made my own thing, the big band, after less than a year in NYC. I wasn’t thinking about it like that at the moment, but I realize now that I’m more of a “build your own house” instead of “making your seat at the table” kind of gal. I believe that it’s better to make your own thing and find those who are into what you do instead of trying to fit into a world that already exists but doesn’t accept you fully. I hate compromise and conditions. Also, I’m stubborn and like to do things my way, and I have an urge to create my own music that I can’t deny. As far as building something, I believe that in the end, people come to you, you don’t have to run after them so hard. If it’s meant to be, it will happen. Jazz is misconstrued as a macho music. In reality, it is a very “feminine” music (if we’re going to genderize) because it’s all about listening and adapting, which is truly feminine. Yes, there are a lot of macho musicians, but the music itself isn’t macho. How could music be macho? Music is music, and it belongs to everyone. You’ve mentioned a list of daily struggles – where you test your vulnerability and spirituality and you look for signs of inspiration… How do you test your vulnerability and spirituality? How do you question your instincts? Well, I don’t question my instincts, that’s first. Instinct is everything. In fact, I try to develop it, make it sharper. So I listen to myself, I listen closely. If it feels right, I don’t question it and go for it, and I don’t anticipate an outcome (at least I try not to). If it feels wrong, hesitant, I fall back, retreat, or simply observe the feeling or the situation. I don’t get involved if I’m not feeling it. Lately, I’ve been going to busk in the subway to practice my improvisation, and make a bit of money. That’s a real test! And I love it. It tests my resilience, and makes me practice “letting go,” adapting to the moment and letting things happen. It’s humbling, as it allows me to get rid of ego. Whether the feedback from commuters, general environment, or even my own mind is positive or negative, I take it in gladly and let it right back out. It’s like always going back to a blank canvas. If I let all the happenings and feelings accumulate, pretty soon my insides would be a mess. It puts me in a very positive flow where people I need to meet or be in touch with seem to come. It’s really magical. On a practical level, I get a lot of playing in every day, which I wouldn’t do as much if I was just home. I need an extra push and extra limits in order to really put in the hours on the piano. And frankly in most things. I work pretty decent under pressure, though I would rather not. In terms of signs of inspiration, what is your biggest motivation/inspiration, today? For motivation right now, it’s no outer idea or goal, but simply the situations I put myself in that force myself to act (ex: the busking). But actually the recording project I have in mind is pretty damn exciting – I’m working on building it up now. And as a whole, yes I do have a motivational thought, which is simply that I want to live of music, do it all the time and not do anything else. So I put in the work to make that real. And it’s real everyday, since I am doing it. So I maintain and grow. For inspiration, it’s usually people, or the emotions that they evoke in me. Those emotions trigger much of my creative process. The entrepreneurial/creative realm of work is often glorified – and so many of us advertise solo careers in a way that makes the industries appear flawless. You are very open about the ups and downs that you face. Why is this so important to you? Well because it’s just the truth I guess. And for me to express this truth is my way to make everyone feel a bit less alienated. That’s important to me. Being a creative woman myself, I have experienced my own share of spells where the creative well is running dry! Where do you go or what do you do when you’re in need of a creative re-fresh? I go see a concert usually, or sometimes I’ll hang out with other artist friends and we talk about our issues and it often unlocks something. It’s good to get out of one’s own head, change perspective a bit. I’ve also started giving myself a mandatory rest day once a week, where I can be the biggest couch potato, not look at my phone and I don’t let myself feel guilty about it for one second. I’m surprised how much real rest actually helps refresh the mind. What is one misconception about the music industry that you hope your work with Liberté Big Band helps to debunk? That “complicated music” can’t be popular and successful. Let’s see, we haven’t debunked it yet but I have full faith in it. Just look at Kamasi Washington, his music isn’t a walk in the park, and yet he’s had huge success the last couple of years. I esepcially admire Maria Schneider for completely crowd-funding all her artistic endeavours through ArtistShare. I don’t know why more people in jazz aren’t taking a positive example from her. She is a big band composer too, The Maria Schneider Orchestra, you may dig it! I did not choose to leave, I was “forcefully removed,” as they call it. I had VISA timing issues, and could no longer stay in the States. It was a real shock and totally unexpected. Turned my whole life around in one night. One legal mistake totally threw off my whole plan. Has leaving The Big Apple benefited you? Why or why not? It has in many ways, but also remember that I will be back when I can go back. I love NYC and only barely got started there, in my opinion. I’m excited for my comeback, though I don’t know yet when that will be. Being away from NYC means being back at home with my base and my support system and my comfort, which means basic living is so much easier. This gives me more time to practice and compose, and that is essential, and I needed it badly. NYC is exhausting and the fatigue will creep up on you and then it’s very difficult to reset the clocks. It’s also great to be in Montreal because I can build relationships here, which I hadn’t done before leaving and settling in NYC. So it’s a new beginning. The Liberté Big Band is continuing in NYC under the direction of drummer Zack O’Farrill, which is a true blessing as well as a great career opportunity. Upon my return to the motherland, I founded Liberté Big Band: Montreal Formation, so it’s like a music franchise (joke!). It does allow me to sort of be in two places at once, through my music and those who play it. Recently, Liberté Big Band put on a free street show in the large American city. What was this like? How did it resonate with your audiences? The band performed that street show without me (though I administered it from online). Do you hope to have a similar type of show in Montreal/other cities in Canada? Of course! Ideally I would partner with an organizer, like what was done in NYC. It’s much easier to share specific tasks rather than produce the entire thing on your own. And thanks to the NYC popup, #concreteseries, I saw that there were people doing exactly that. Photo by: Jason Moskowitz. http://www.jasonmoskowitz.com. What are your hopes for Liberté Big Band in the future? Take over the world! Haha. I want what many artists want, to live from my art. I want to tour, to get our music out, to get it heard. It’s pretty simple really. How to do it is the question. So I try not to limit myself in the HOW of things. I’m down for the unconventional routes, or whatever works at the time. I want to produce big shows, multi-media things and get into some techy stuff like surround-sound and virtual reality; I find it fascinating. Liberté-Anne, thank you for sharing your story with A Quarter Young. We can’t wait to to tune into your future endeavours as an artist. Liberté Big Band’s next performance in NYC is in Manhattan at the Rockwood Music Hall on September 17, one set only, beginning at 7pm. The band’s next gig in Montreal is at La Salla Rossa on September 27. Find out more at libertebigband.com.